For years people depended on candy fundraisers as their main revenue source. However two issues developed that created a new opportunity and Healthy Snack Fundraising programs grew as a result of those issues. Why not hold a candy fundraiser? Candy fundraising became an issue for lots of schools as more and more school districts determined they wanted to control the types of foods offered not only on campus but by the students in general. As they tackled health issues lots of schools decided to ban the sale of chocolate bars on campus and that put the brakes on one of the easiest ways to raise money. The other reason some groups shied away from candy fundraising was the need to spend money to purchase the candy to begin the fundraiser. Unless you were a school with credit most groups had to pay for their candy before it was shipped to them and that meant groups with little money couldn’t afford to even get started. How are these Snack Fundraisers different? Healthy Snack fundraisers are different for two reasons. First they don’t cost anything to get started. Unlike typical candy fundraisers these are brochure sales which means that each member of your group is given a brochure and order form to sell snacks from. They take orders and then at the end of the fundraiser the group places a bulk order for the items sold. That means that it doesn’t cost anything to start one of these programs. The other major different is the selection of products. We offer two different snack fundraisers and both offer much healthier options than just chocolate bars. There are lots of selections including some items with chocolate. But overall most districts allow these products for a school fundraiser. 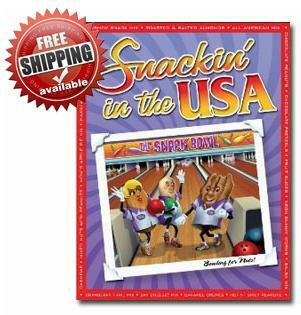 We first added Snackin in the USA about a year ago and weren’t sure how it would be greeted. Much to our surprise it more than exceeded not only our expectation but our fundraising groups had nothing but compliments about the program. You sell more than 30 different items including: Chocolate Covered Almonds, Butter Toffee Peanuts, Say Cheese! Mix, Hawaiian Delight, Fruit Salad Mix, Gummi Bears, Neon Sour Gummy Worms, Mixed Nuts with Peanuts, Peanut Squares, Candy Cherries, Hot Tamales, Cashew Snack Mix, Sweet n’ Crunchy Trail Mix, Chocolate Non-Pareils, Cashew Halves, Chocolate Malted Milk Balls, Chocolate Covered Pretzels, Chocolate Covered Animal Crackers, Caramel Cremes, Neopolitan Pretzel Mix, Gummi Fruit Slices, Honey Roasted Peanuts, Chocolate Covered Peanuts, Chocolate Covered Raisins, Peanut Brittle, All American Mix, Roasted & Salted Almonds, Cranberry Trail Mix, Mom’s Apple Pie Mix, Peanut Chews, Salsa Mix. Around the same time we introduced our new Trail mix fundraiser. It features trail and snack mixes with a great variety of healthy products ranging from the Natural Snacks trail mix to the Yogurt Pretzels and Red Licorice. We believe everyone can find a snack they will enjoy. Each bag of trail mix sells for only $6. We provide your group with free brochures so that you can pre-sell the snack and trail mixes. That means this fundraiser is free to start. Click for more details.